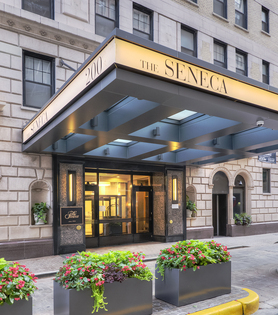 Originally constructed in 1924 to eventually become a renowned hotel, The Seneca is a fifteen-story historic building reimagined into a community of modern, boutique apartments. Here, a stately European-style façade combines with fresh, contemporary finishes that give the space a sense of romanticism and sophistication. Fusing a distinguished Gold Coast lifestyle with the charm of a vintage landmark, this community is ideal for those seeking an upscale living experience in the heart of a vibrant Chicago neighborhood. The studio, one and two bedroom apartments for rent exude metropolitan elegance with interior finishes such as dark hardwood-style flooring, stainless steel appliances and crown molding. Glamorous community amenities, including on-site dry cleaning, a state-of-the-art fitness center, a coffee bar and a spacious sundeck add quality to your lifestyle. Ideally located just steps from the lakefront, popular restaurants and Chicago’s best shopping on the Magnificent Mile, The Seneca offers everything you expect in a distinctive Gold Coast community. Get in touch with a friendly leasing agent today for more details.